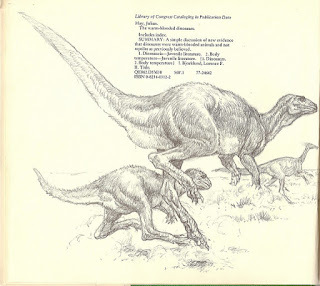 Given what you said about The New Dinosaurs, it seems odd that Dixon often seemed to be so averse to the idea that birds are theropod dinosaurs. Fantastic post, by the way. 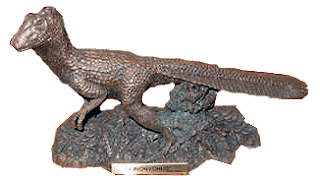 McLoughlin's 1979 feathered Coelurus is still incredibly prescient, even if McLoughlin subscribed to the 'frayed scales' idea at the time. Damn, that Sergai Avimimus is easily the most prescient of all of these. 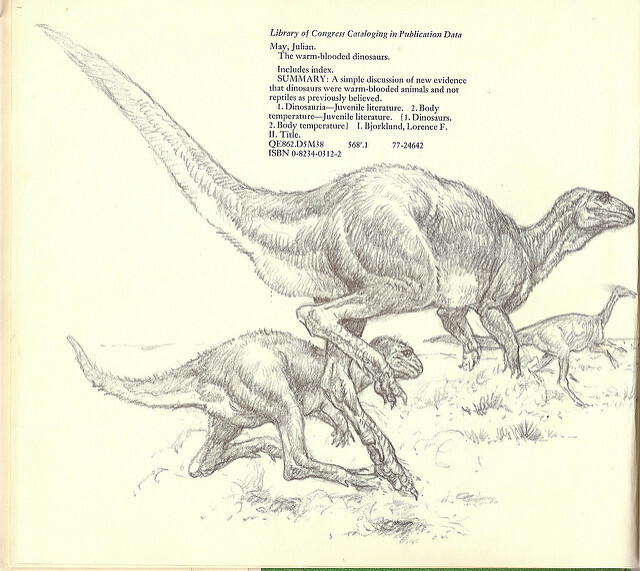 John McLoughlin, an old friend & near neighbor, at least by New Mexico standards, had the concept by 1979, when he wrote and illustrated Archosauria- his Coelurusis is pretty good,though it lacks "wings", functional or other. 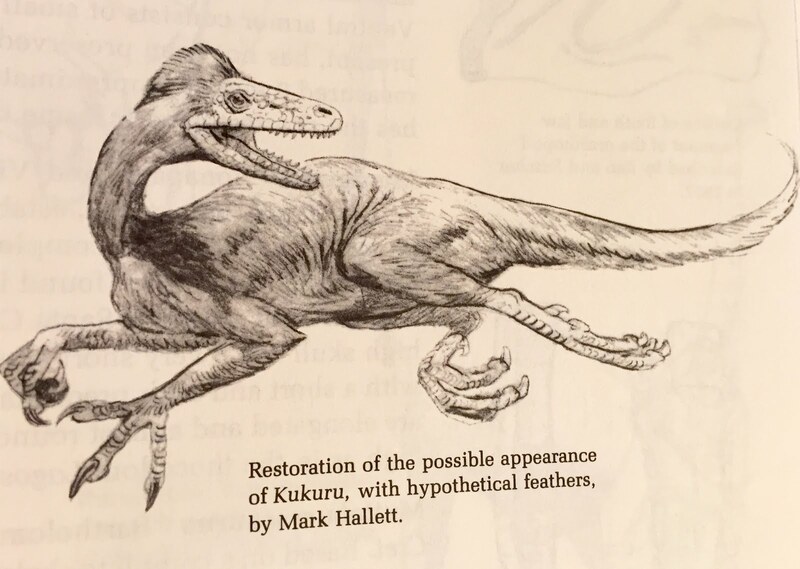 The best joke is on the next two pages, where he depicts an Archaeopteryx on the left and a Saurornithoides on the right.The second has no obvious feathers, while he first has what we now think of as typical small theropod feathering. I have suggested that in the real world both would look he same! By 1984, the twin cloned Deinonychids who are the pets and executioners of the evil asteroid belt regent Lothar, are as birdlike as any "modern" reconstruction. 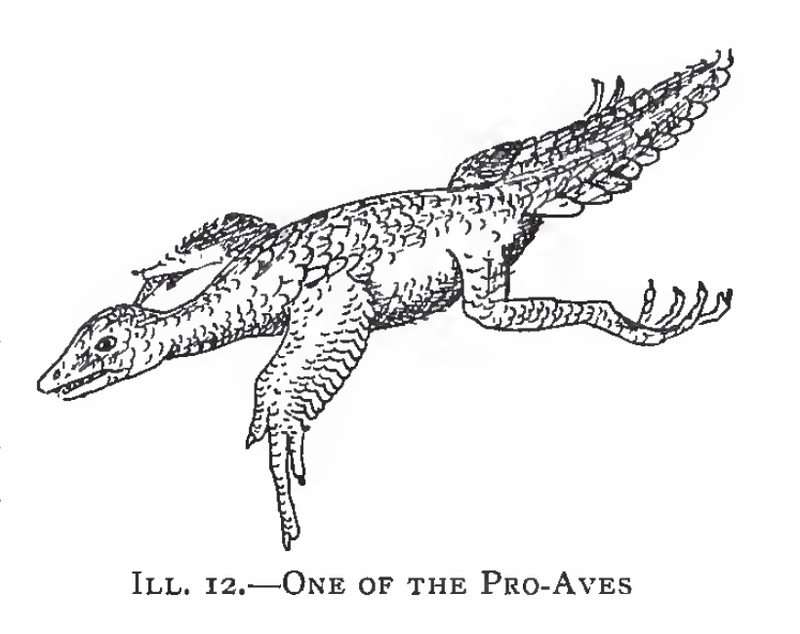 He describes them as "of the Dinosauria, a lost race of BIRDLIKE beings.. 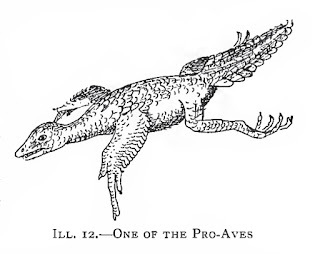 They are: "Man- high, smooth coated in short blackly irridescent feathers, red of eye and each wearing a diamond studded Regency orange collar." 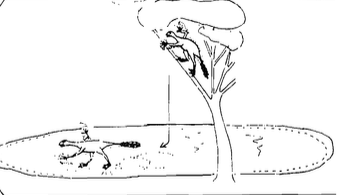 I also have Beebe's own copy of his 1905 book Our Search for a Wilderness, with his dino bookplate. It does look remarkably like Microraptor, especially when I painted my model shiny black with yellow eyes. We call it "Beebesaurus". 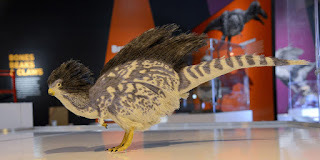 Like many others, I, too, was under the impression that speculation and depictions of feathered non-avian dinosaurs only dated back to the 2000s, or the 1990s at most. I was surprised when I found some from the 1980s and 1970s. Imagine my shock and delight, then, when I stumbled upon this article, which includes depictions from the 1900s and 1910s. This led me to do more research on the history of feathered dinosaur depictions. What I found could not have been any more monumental to me. "There is no evidence that Compsognathus possessed feathers; but, if it did, it would be hard indeed to say whether it should be called a reptilian bird or an avian reptile." 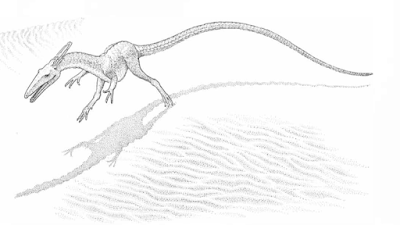 Huxley included a drawing of Compsognathus with this lecture, and, even though it is not stated in the text, I can't help but notice that it has been drawn with what appears to me to be a faint outline of black, fuzzy bristles. And comparing this picture to Sarah Landry's 1975 Syntarsus depiction, I can't help but notice a similarity. Coincidence, perhaps? 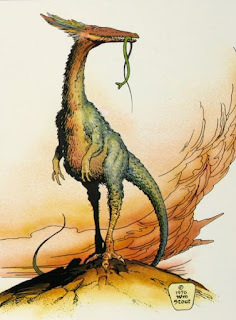 Or does the honor of being the first dinosaur depicted with feathers in an illustration go to Compsognathus – in the 1870s?